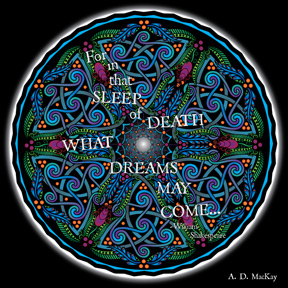 Description: Inspired by Zentangle, Native American traditions, and Celtic art, Hamlet's death contemplation is illuminated in this dreamcatcher for the ultimate sleep: death itself. The white light at the perimeter and the centre of the image symbolize the white light at the end of the tunnel that is said to occur after death. What is seen beyond that, only time will tell.